This product should be in stock on Tuesday 04 June, 2019. 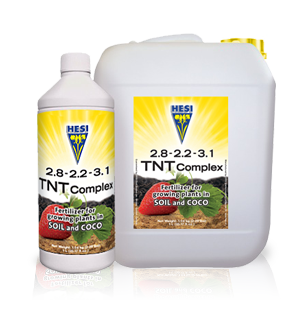 Hesi TNT Complex is a very powerful growth supplement which uses 100% organic nitrogen. Organic nitrogen compounds have no EC value because they are not salts, but they do contain a high percentage of nitrogen. TNT Complex contains all necessary nutrients and has been enriched with many vital components which guarantee successful growth. Plants that are treated with TNT Complex develop a large number of growing points and are strong and healthy. Liquid Humic Acid. 32 fl. oz.